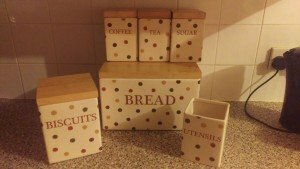 A six pièce polka dot ceramic kitchen accessory set, comprising a biscuit barrel, a bread bin, a utensil holder, tea, coffee and sugar canisters, each with wooden lids. 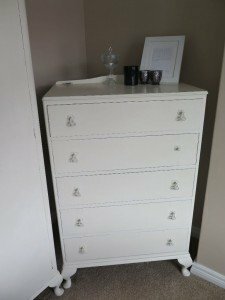 A hand painted chest of five drawers with crystal knobs, together with a photo frame, three crackle glass candle holders and a crystal lidded jar. 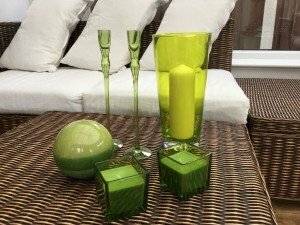 A small collection of green glass accessories, to include two tall standing candle holders, a large orb ball, two square candles and a tall vase shaped candle holder. 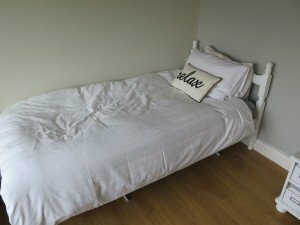 A solid wood hand painted single bed frame in the shabby chic style, together with a single mattress. 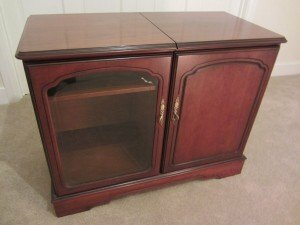 A mahogany double door entertainment unit, having inner shelves and brass handles. 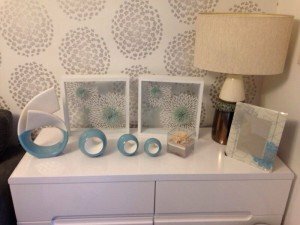 A small collection of decorative accessories, to include a blue and white irregular shaped ornament, three plus tea light holders, two floral pictures, a table lamp etc. 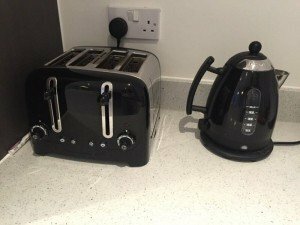 A Dualit four slice black and chrome toaster, together with a matching kettle. 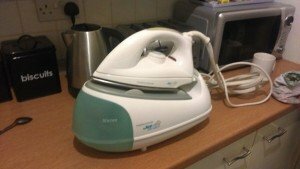 A small amount of kitchen accessories, to include a white Morphy Richards steam iron, a stainless steel and black kettle and matching four slice toaster, a silver microwave and black tea, coffee and sugar canisters. 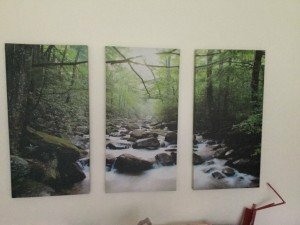 A large three piece wall canvas depicting the sun shining through a forest scenery. 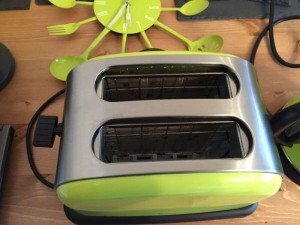 A lime green and stainless steel two slice toaster, together with a matching lime green wall clock. 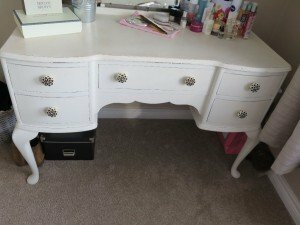 A five drawer hand painted dressing unit in the shabby chic style, with flower head knobs. 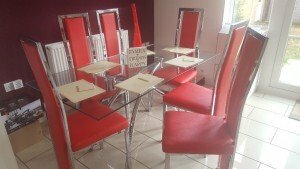 A glass and chrome rectangular dining table, together with six red leather high back dining chairs, six cream faux leather placemats and matching coasters. 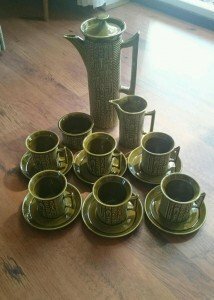 A green Port Merion full coffee set, comprising a large coffee pot, a milk jug, a sugar bowl, six mugs and six saucers. 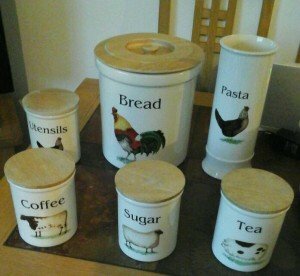 A six piece farm house kitchen canister set, comprising a bread bin, a pasta barrel, a utensil pot, tea, coffee and sugar canisters, decorated with different farmhouse animals. 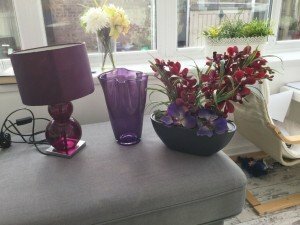 A small collection of living room accessories, to include a purple glass table lamp, and irregular shaped purple vase and a decorative faux plant in pot. 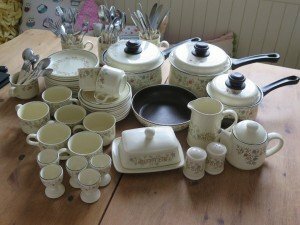 A large collection of Country garland patterned kitchenware accessories, to include three lidded saucepans, a frying pan, egg cups, tea cups, saucers, cutlery, etc. 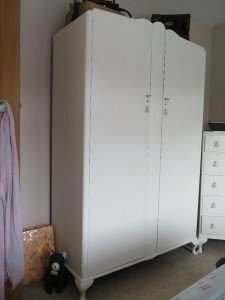 A large two door double wardrobe in the shabby chic style, hand painted in white with crystal handles. 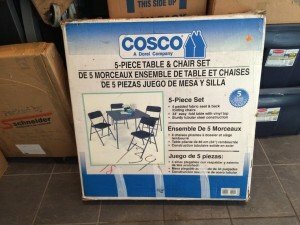 A brand new boxed Cosco outdoor table and chair set, to include four padded fabric folding chairs and a square vinyl topped table. 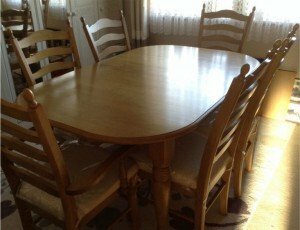 A solid oak rounded edge oval dining table, together with six matching high back dining chairs and six removable patterned chair cushions.